“The finance industry relies on complexity and confusion in order to protect their own self interest - Andrew shatters that! His book makes financial investing simple and understandable. This book will help you protect your principal and grow your equity all while sleeping well each night." There once lived a man so great that a trophy was named in his honor. This man was a football coach, and he had just experienced the most crushing defeat of his life. His team was expected to handily defeat all of the competition, but instead they were heading home as losers. At the start of the very next year, this coach brought a new approach to his players in training camp. The very first practice started with the fundamentals of basic tackling, the heart and soul of football. From there he moved methodically through each fundamental, un-turning each stone with football basics that should've been learned as a child. Players even joked that the coach was going "too fast" for them. But this coach stuck to his resolve. The coach's name was Vince Lombardi, and he was handsomely rewarded for his patience. The team went on to win the Super Bowl, and continue to completely dominate the field with 5 subsequent championships. The league even named the championship trophy after Mr. Lombardi. As investors, it's easy to overlook fundamentals such as profit, loss, and debt. We get so caught up in the latest equations and analyses that we forget the basic concepts that make a company succeed. Yet success is found in the basics. Consider the advice of the most successful baseball hitter of all time. His name was Ted Williams, and he was able to hit .400 for an entire season in a game where hitting .300 is considered outstanding. Lucky for us, he was generous with his secret to success. Ted once said that he concentrated not on which balls to hit, but which balls not to hit. By calculating which areas of the strike zone were most likely to result in a base hit, Williams stopped swinging at pitches outside of this area. He become the best hitter in the game. Perhaps there is no coincidence that Warren Buffett utilized the baseball metaphor, saying he will wait for as long as it takes to find his "perfect pitch". Investors can learn valuable lessons from Mr. Buffett and Mr. Williams. You see, it's not the ability to pick winning stocks that correlates to high returns in the stock market. Any monkey with a pair of darts can do just as well. Instead, it's the ability to avoid the stocks that will make you "strike out", which will allow you to beat the market year after year. The stocks that make you strike out are the ones that result in a complete loss of capital. For every different stock you invest in, the worst case scenario is always the same: bankruptcy. If you can learn what a company about to go bankrupt looks like, you'll never fear an investment ever again. Why are doctors so confident in their abilities? They've extensively studied the symptoms, so they are quickly able to differentiate between a heart attack and a headache. You can do the same in the stock market. One of the greatest chessmasters in the world shared his unique approach to learning the game. While most everybody focuses on optimizing their beginning attack strategy, this master was advised to concentrate on the end game instead. He methodically practiced using just his king, or a king and a pawn, to achieve the ultimate victory. Soon, this chessmaster was able to deconstruct every chess strategy in the game at an extremely rapid pace, just by mastering his skills backwards. In the same token, investors often blindly pile into the "buy side" of the equation. So many of them get caught up with how much money they can make, or how much their growth models can be optimized. Instead, there's vast opportunity in approaching the field of investing backwards. By learning how to spot and identify value traps, you remove your biggest threat to investing success. These black swans, the unpredictable events that shatter the most sturdy of portfolios, are impossible to forecast yet ridiculously easy to avoid. While the time and place of death can never be anticipated, the symptoms are always the same. The principles expressed here led me to dive into extensive research behind why companies went bankrupt, and reveal them in Value Trap Indicator: Examining the Biggest Bankruptcies of the 21st Century to Formulate a Proven Buy Low, Sell High Approach. Look, you can't know what you're missing until you've experienced it yourself. As an experienced investor who has helped thousands of individuals start investing, I can tell you first hand how great it feels to decode something complex and make it real simple. The look of confidence I'm able to share with my wife and family comes not blindly, but from the assurance that my investments will provide the future we've always desired. The future of no longer laboring hard for money, but letting money work for me. The peace of mind that my investments won't disappear with the next market crisis. The clarity to know that if even the government fails tomorrow, my family will still prosper. You can experience these same feelings too. Not only that, but an education in value traps could be extremely profitable as well. Are you ready for it? Andrew Sather is the founding publisher of The Sather Research eLetter and einvestingforbeginners.com. He specializes in identifying value traps and avoiding stock market bankruptcies. In a market driven by emotions like fear and greed, he presents a number based approach to consistently picking profitable stocks. 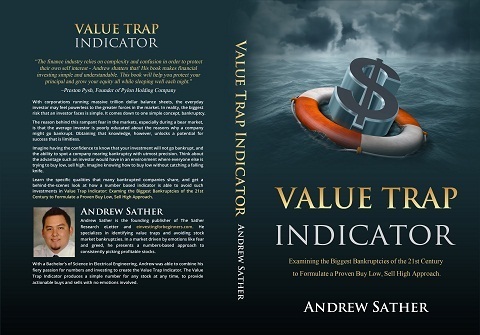 With a BSEE, Andrew was able to combine his fiery passion for numbers and investing to create the Value Trap Indicator. Which package do you think is the best for me? It depends on how much you are willing to spend. Obviously the complete package will give you the most value, with access to data from all 30 bankruptcies and an editable spreadsheet to allow Value Trap Indicator calculations on any stock. But, the book alone is also a fantastic value and teaches you everything you'll need to know. What if I want to learn more about you and what you do? Please, feel free to check out everything I'm doing online at my public website einvestingforbeginners.com. My philosophy is one of sharing as much knowledge as I can, and I try to accomplish that mission with everything on the blog and in my books. I've written over 200 blog posts varying from investing basics to value investing strategies. What if I have another question you haven't answered? Feel free to email me at andrew@einvestingforbeginners.com for any questions or concerns. Your complete satisfaction is my #1 goal and so don't hestitate to contact me for any reason. I hope my passion leaks through and inspires, enlightens, and enriches. Absolutely. I always want my customers completely satisfied, and if for any reason you aren't, you may get a full refund within the first 30 days. Simply email support at newsletter@einvestingforbeginners.com and we will promtply refund your purchase. What if this book isn't right for me? Can I get money back? The advice on Wall Street is always the same: buy low, sell high. But nobody talks about the risks involved with this. You think you can buy low easily, until a company like Lehman Brothers comes along. That's why I wrote this book, to keep investors safe from value traps like this.